Columbanus taught an Irish monastic rule and penitential practices for those repenting of sins, which emphasised private confession to a priest, followed by penances levied by the priest in reparation for the sins. Columbanus is one of the earliest identifiable Hiberno-Latin writers. Most of what we know about Columbanus is based on Columbanus' own works (as far as they have been preserved) and Jonas of Bobbio's Vita Columbani (Life of Columbanus), which was written between 639 and 641. [Note 1] Jonas entered Bobbio after Columbanus' death but relied on reports of monks who still knew Columbanus. A description of miracles of Columbanus written by an anonymous monk of Bobbio is of much later date. In the second volume of his Acta Sanctorum O.S.B., Mabillon gives the life in full, together with an appendix on the miracles of the saint, written by an anonymous member of the Bobbio community. Columbanus (the Latinised form of Columbán, meaning the white dove) was born in the Kingdom of Meath, now part of Leinster, in Ireland in 543, the year Saint Benedict died at Monte Cassino. Prior to his birth, his mother was said to have had visions of bearing a child who, in the judgment of those interpreting the visions, would become a "remarkable genius". Columbanus was well-educated in the areas of grammar, rhetoric, geometry, and the Holy Scriptures. Columbanus left home to study under Sinell, Abbot of Cluaninis in Lough Erne. [Note 2] Under Sinell's instruction, Columbanus composed a commentary on the Psalms. He then moved to Bangor Abbey on the coast of Down, where Saint Comgall was serving as the abbot. He stayed at Bangor until his fortieth year, when he received Comgall's permission to travel to the continent. Columbanus gathered twelve companions for his journey—Saint Attala, Columbanus the Younger, Cummain, Domgal (Deicolus), Eogain, Eunan, Saint Gall, Gurgano, Libran, Lua, Sigisbert, and Waldoleno—and together they set sail for the continent. 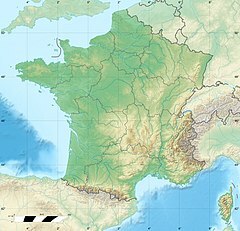 After a brief stop in Britain, most likely on the Scottish coast, they crossed the channel and landed in Brittany in 585. At Saint-Malo in Brittany, there is a granite cross bearing the saint's name to which people once came to pray for rain in times of drought. The nearby village of Saint-Coulomb commemorates him in name. Columbanus and his companions were received with favour by King Gontram of Burgundy, and soon they made their way to Annegray, where they founded a monastery in an abandoned Roman fortress. Despite its remote location in the Vosges Mountains, the community became a popular pilgrimage site that attracted so many monastic vocations that two new monasteries had to be formed to accommodate them. In 590, Columbanus obtained from King Gontram the Gallo-Roman castle called Luxovium in present-day Luxeuil-les-Bains, some eight miles from Annegray. The castle, soon transformed into a monastery, was located in a wild region, thickly covered with pine forests and brushwood. Columbanus erected a third monastery called Ad-fontanas at present-day Fontaine-lès-Luxeuil, named for its numerous springs. These monastic communities remained under Columbanus' authority, and their rules of life reflected the Irish tradition in which he had been formed. As these communities expanded and drew more pilgrims, Columbanus sought greater solitude, spending periods of time in a hermitage and communicating with the monks through an intermediary. Often he would withdraw to a cave seven miles away, with a single companion who acted as messenger between himself and his companions. I am not the author of this divergence. I came as a poor stranger into these parts for the cause of Christ, Our Saviour. One thing alone I ask of you, holy Fathers, permit me to live in silence in these forests, near the bones of seventeen of my brethren now dead. Columbanus was also involved in a dispute with members of the Frankish royal family. Upon the death of King Gontram of Burgundy, the succession passed to his nephew, Childebert II, the son of his brother Sigebert and Sigebert's wife Brunhilda of Austrasia. When Childebert II died, he left two sons, Theuderic II who inherited the Kingdom of Burgundy, and Theudebert II who inherited the Kingdom of Austrasia. Since both were minors, Brunhilda, their grandmother, declared herself their guardian and controlled the governments of the two kingdoms. Theuderic II venerated Columbanus and often visited him, but the saint admonished and rebuked him for his behaviour. When Theuderic began living with a mistress, the saint objected, earning the displeasure of Brunhilda, who thought a royal marriage would threaten her own power. The saint did not spare the demoralised court, and Brunhilda became his bitterest foe. Angered by the saint's moral stand, Brunhilda stirred up the bishops and nobles to find fault with his monastic rules. When Theuderic II finally confronted Columbanus at Luxeuil, ordering him to conform to the country's conventions, the saint refused and was then taken prisoner to Besançon. Columbanus managed to escape his captors and returned to his monastery at Luxeuil. When the king and his grandmother found out, they sent soldiers to drive him back to Ireland by force, separating him from his monks by insisting that only those from Ireland could accompany him into exile. They come to tell me the ship is ready. The end of my parchment compels me to finish my letter. Love is not orderly; it is this which has made it confused. Farewell, dear hearts of mine; pray for me that I may live in God. Soon after the ship set sail from Nantes, a severe storm drove the vessel back ashore. Convinced that his holy passenger caused the tempest, the captain refused further attempts to transport the monk. Columbanus made his way across Gaul to visit King Chlothar II of Neustria at Soissons where he was gladly received. Despite the king's offers to stay in his kingdom, Columbanus left Neustria in 611 for the court of King Theudebert II of Austrasia in the northeastern part of the Kingdom of the Merovingian Franks. Columbanus travelled to Metz, where he received an honourable welcome, and then proceeding to Mainz, where he sailed upwards the Rhine river to the lands of the Suebi and Alemanni in the northern Alps, intending to preach the Gospel to these people. He followed the Rhine river and its tributaries, the Aar and the Limmat, and then on to Lake Zurich. Columbanus chose the village of Tuggen as his initial community, but the work was not successful. He continued north-east by way of Arbon to Bregenz on Lake Constance. Here the saint found an oratory dedicated to Saint Aurelia containing three brass images of their tutelary deities. Columbanus commanded Gallus, who knew the local language, to preach to the inhabitants, and many were converted. The three brass images were destroyed, and Columbanus blessed the little church, placing the relics of Saint Aurelia beneath the altar. A monastery was erected, Mehrerau Abbey, and the brethren observed their regular life. Columbanus stayed in Bregenz for about one year. 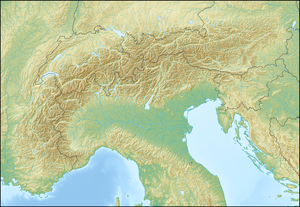 Following an uprising against the community, possibly related to that region being taken over by the saint's old enemy King Theuderic II, Columbanus resolved to cross the Alps into Italy. Gallus remained in this area and died there 646. About seventy years later at the place of Gallus' cell the Monastery of Saint Gall was founded, which in itself was the origin of the city of St. Gallen again about another three hundred years later. Columbanus arrived in Milan in 612 and was warmly greeted by King Agilulf and Queen Theodelinda of the Lombards. [Note 4] He immediately began refuting the teachings of Arianism, which had enjoyed a degree of acceptance in Italy. He wrote a treatise against Arianism, which has since been lost. Queen Theodelinda, the devout daughter of Duke Garibald I of Bavaria, played an important role in restoring Nicene Christianity to a position of primacy against Arianism, and was largely responsible for the king's conversion to Christianity. At the king's request, Columbanus wrote a letter to Pope Boniface IV on the controversy over the Three Chapters—writings by Syrian bishops suspected of Nestorianism, which had been condemned in the fifth century as heresy. Pope Gregory I had tolerated in Lombardy those persons who defended the Three Letters, among them King Agilulf. Columbanus agreed to take up the issue on behalf of the king. The letter begins with an apology that a "foolish Scot (Scottus, Irishman)" would be writing for a Lombard king. After acquainting the pope with the imputations brought against him, he entreats the pontiff to prove his orthodoxy and assemble a council. He writes that his freedom of speech is consistent with the custom of his country. Some of the language used in the letter might now be regarded as disrespectful, but in that time, faith and austerity could be more indulgent. At the same time, the letter expresses the most affectionate and impassioned devotion to the Holy See. We Irish, though dwelling at the far ends of the earth, are all disciples of Saint Peter and Saint Paul ... we are bound to the Chair of Peter, and although Rome is great and renowned, through that Chair alone is she looked on as great and illustrious among us ... On account of the two Apostles of Christ, you are almost celestial, and Rome is the head of the whole world, and of the Churches. If Columbanus' zeal for orthodoxy caused him to overstep the limits of discretion, his real attitude towards Rome is sufficiently clear, calling the pope "his Lord and Father in Christ", the "Chosen Watchman", and the "First Pastor, set higher than all mortals". During the last year of his life, Columbanus received messenges from King Chlothar II, inviting the saint to return to Burgundy, now that his enemies were dead. Columbanus did not return, but requested that the king should always protect his monks at Luxeuil Abbey. He prepared for death by retiring to his cave on the mountainside overlooking the Trebbia river, where, according to a tradition, he had dedicated an oratory to Our Lady. Columbanus died at Bobbio on 21 November 615. The Rule of Saint Columbanus embodied the customs of Bangor Abbey and other Irish monasteries. Much shorter than the Rule of Saint Benedict, the Rule of Saint Columbanus consists of ten chapters, on the subjects of obedience, silence, food, poverty, humility, chastity, choir offices, discretion, mortification, and perfection. For indeed those who desire eternal rewards must only consider usefulness and use. Use of life must be moderated just as toil must be moderated, since this is true discretion, that the possibility of spiritual progress may be kept with a temperance that punishes the flesh. For if temperance exceeds measure, it will be a vice and not a virtue; for virtue maintains and retains many goods. Therefore we must fast daily, just as we must feed daily; and while we must eat daily, we must gratify the body more poorly and sparingly ..."
In the fourth chapter, Columbanus presents the virtue of poverty and of overcoming greed, and that monks should be satisfied with "small possessions of utter need, knowing that greed is a leprosy for monks". Columbanus also instructs that "nakedness and disdain of riches are the first perfection of monks, but the second is the purging of vices, the third the most perfect and perpetual love of God and unceasing affection for things divine, which follows on the forgetfulness of earthly things. Since this is so, we have need of few things, according to the word of the Lord, or even of one." In the fifth chapter, Columbanus warns against vanity, reminding the monks of Jesus' warning in Luke 16:15: "You are the ones who justify yourselves in the eyes of others, but God knows your hearts. What people value highly is detestable in God's sight." In the sixth chapter, Columbanus instructs that "a monk's chastity is indeed judged in his thoughts" and warns, "What profit is it if he be virgin in body, if he be not virgin in mind? For God, being Spirit." So discretion has got its name from discerning, for the reason that it discerns in us between good and evil, and also between the moderate and the complete. For from the beginning either class has been divided like light and darkness, that is, good and evil, after evil began through the devil's agency to exist by the corruption of good, but through God's agency Who first illumines and then divides. Thus righteous Abel chose the good, but unrighteous Cain fell upon evil." In the ninth chapter, Columbanus presents mortification as an essential element in the lives of monks, who are instructed, "Do nothing without counsel." Monks are warned to "beware of a proud independence, and learn true lowliness as they obey without murmuring and hesitation." According to the Rule, there are three components to mortification: "not to disagree in mind, not to speak as one pleases with the tongue, not to go anywhere with complete freedom." This mirrors the words of Jesus, "For I have come down from heaven not to do my will but to do the will of him who sent me." (John 6:38) In the tenth and final chapter, Columbanus regulates forms of penance (often corporal) for offences, and it is here that the Rule of Saint Columbanus differs significantly from that of Saint Benedict. The habit of the monks consisted of a tunic of undyed wool, over which was worn the cuculla, or cowl, of the same material. A great deal of time was devoted to various kinds of manual labour, not unlike the life in monasteries of other rules. 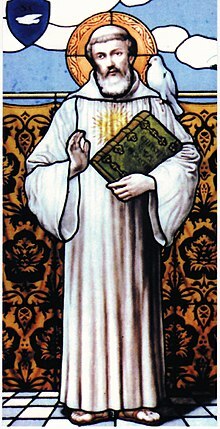 The Rule of Saint Columbanus was approved of by the Synod of Mâcon in 627, but it was superseded at the close of the century by the Rule of Saint Benedict. For several centuries in some of the greater monasteries the two rules were observed conjointly. Columbanus did not lead a perfect life. According to Jonas and other sources, he could be impetuous and even headstrong, for by nature he was eager, passionate, and dauntless. These qualities were both the source of his power and the cause of his mistakes. His virtues, however, were quite remarkable. Like many saints, he had a great love for God's creatures. Stories claim that as he walked in the woods, it was not uncommon for birds to land on his shoulders to be caressed, or for squirrels to run down from the trees and nestle in the folds of his cowl. Although a strong defender of Irish traditions, he never wavered in showing deep respect for the Holy See as the supreme authority. His influence in Europe was due to the conversions he effected and to the rule that he composed. It may be that the example and success of Saint Columba in Caledonia inspired him to similar exertions. The life of Columbanus stands as the prototype of missionary activity in Europe, followed by such men as Saint Kilian, Vergilius of Salzburg, Donatus of Fiesole, Wilfrid, Willibrord, Suitbert of Kaiserwerdt, Saint Boniface, and Ursicinus of Saint-Ursanne. Jonas relates the occurrence of a miracle during Columbanus' time in Bregenz, when that region was experiencing a period of severe famine. Although they were without food, they were bold and unterrified in their faith, so that they obtained food from the Lord. After their bodies had been exhausted by three days of fasting, they found so great an abundance of birds, just as the quails formerly covered the camp of the children of Israel, that the whole country near there was filled with birds. The man of God knew that this food had been scattered on the ground for his own safety and that of his brethren, and that the birds had come only because he was there. He ordered his followers first to render grateful praises to the Creator, and then to take the birds as food. And it was a wonderful and stupendous miracle; for the birds were seized according to the father's commands and did not attempt to fly away. The manna of birds remained for three days. On the fourth day, a priest from an adjacent city, warned by divine inspiration, sent a supply of grain to Saint Columban. When the supply of grain arrived, the Omnipotent, who had furnished the winged food to those in want, immediately commanded the phalanxes of birds to depart. We learned this from Eustasius, who was present with the others, under the command of the servant of God. He said that no one of them remembered ever having seen birds of such a kind before; and the food was of so pleasant savor that it surpassed royal viands. Oh, wonderful gift of divine mercy! Columbanus is also remembered as the first Irish person to be the subject of a biography. An Italian monk named Jonas of Bobbio wrote a biography of him some 20 years after Columbanus’ death. His use of the phrase in 600 AD totius Europae (all of Europe) in a letter to Pope Gregory the Great is the first known use of the expression. In France, the ruins of Columbanus' first monastery at Annegray are legally protected through the efforts of the Association Internationale des Amis de St Columban, which purchased the site in 1959. The association also owns and protects the site containing the cave, which acted as Columbanus' cell, and the holy well, which he created nearby. At Luxeuil-les-Bains, the Basilica of Saint Peter stands on the site of Columbanus' first church. A statue near the entrance, unveiled in 1947, shows him denouncing the immoral life of King Theuderic II. Formally an abbey church, the basilica contains old monastic buildings, which have been used as a minor seminary since the nineteenth century. It is dedicated to Columbanus and houses a bronze statue of him in its courtyard. In Lombardy, San Colombano al Lambro in Milan, San Colombano Belmonte in Turin, and San Colombano Certénoli in Genoa all take their names from the saint. The last monastery erected by Columbanus at Bobbio remained for centuries the stronghold of orthodoxy in northern Italy. If Bobbio Abbey in Italy became a citadel of faith and learning, Luxeuil Abbey in France became the "nursery of saints and apostles". The monastery produced sixty-three apostles who carried his rule, together with the Gospel, into France, Germany, Switzerland, and Italy. These disciples of Columbanus are accredited with founding over one hundred different monasteries. The canton and town still bearing the name of St. Gallen testify to how well one of his disciples succeeded. The Missionary Society of Saint Columban, founded in 1916, and the Missionary Sisters of St. Columban, founded in 1924, are both dedicated to Columbanus. The remains of Columbanus are preserved in the crypt at Bobbio Abbey. Many miracles have been credited to his intercession. In 1482, the relics were placed in a new shrine and laid beneath the altar of the crypt. The sacristy at Bobbio possesses a portion of the skull of the saint, his knife, wooden cup, bell, and an ancient water vessel, formerly containing sacred relics and said to have been given to him by Pope Gregory I. According to some authorities, twelve teeth of the saint were taken from the tomb in the fifteenth century and kept in the treasury, but these have since disappeared. Columbanus is named in the Roman Martyrology on 23 November, which is his feast day in Ireland. His feast is observed by the Benedictines on 24 November. Columbanus is the patron saint of motorcyclists. In art, Columbanus is represented bearded bearing the monastic cowl, holding in his hand a book with an Irish satchel, and standing in the midst of wolves. Sometimes he is depicted in the attitude of taming a bear, or with sun-beams over his head. ^ Walker's edition is also available on CELT (University College Cork), a website that provides Irish medieval sources with English translations. A critical edition of Jonas' Vita Columbani was published in 1905 by Bruno Krusch in Monumenta Germaniae Historica, Scriptores Rerum Germaincarum in usum schoarum, vol. 37, Hannover: Hahn 1905. See also Internet Medieval Sourcebook. ^ Cluaninis is derived from the Irish words "Cluan Inis", which mean "meadow island". The remains of the monastery can be seen at Bellanaleck, County Fermanagh. ^ The Italians themselves followed a third system of reckoning Easter, based on the improvements to Victorius's system introduced by Dionysius Exiguus at the time he devised the Anno Domini dating system. ^ Some scholars believe that Columbanus made two journeys into Italy, which were confounded by Jonas. On his first journey, Columbanus went to Rome and received from Pope Gregory I sacred relics. This may possibly explain the traditional spot in St. Peter's, where Pope Gregory I and Columbanus are supposed to have met. ^ Bobbio Abbey may have been the model for the monastery in northern Italy in Umberto Eco's novel The Name of the Rose. ^ a b c d e f g h i j k l m n o p q r s t u v w x y z aa ab ac ad ae af ag Edmonds, Columba (1908). "St. Columbanus". The Catholic Encyclopedia. 4. New York: Robert Appleton Company. Retrieved 15 January 2013. ^ "St. Columban's 1400th death anniversary celebrated in Hong Kong". UCAN. Sunday Examiner. 11 December 2015. Retrieved 19 December 2015. ^ Walker, G. S. Murdoch, ed. (1957). Columbani Opera. Dublin: The Dublin Institute for Advanced Studies. ISBN 978-1-85500-050-6. ^ Lapidge, Michael (1997). Columbanus: Studies on the Latin Writings. Woodbridge: Boydell Press. ISBN 978-0-85115-667-5. ^ O'Hara, Alexander, and Faye Taylor. "Aristocratic and Monastic Conflict in Tenth-Century Italy: the Case of Bobbio and the Miracula Sancti Columbani" in Viator. Medieval and Renaissance Studies. 44:3 (2013), pp. 43–61. ^ a b c Smith 2012, p. 201. ^ Jonas 643, p. 6. ^ Jonas 643, p. 7. ^ Wallace 1995, p. 43. ^ Jonas 643, p. 10. ^ a b c "Columbanus Today: Places of His Ministry". Monastic Ireland. Retrieved 15 January 2013. ^ a b c "St. Columbanus". Catholic News Agency. Retrieved 16 January 2013. ^ a b c Jonas 643, p. 17. ^ Blackburn 1999, p. 767. ^ Cusack 2002, p. 173. ^ Montalembert 1861, p. 440. ^ Allnatt 2007, p. 105. ^ Montalembert 1861, p. 444. ^ a b c d e f g h i j k Columbanus Hibernus. Walker, G.S.M. (ed.). "Monk's Rules". Corpus of Electronic Texts. University College Cork. Retrieved 19 January 2013. ^ Montalembert 1898, II p. 405. ^ Jonas 643, p. 54. ^ Webb, Alfred (2009). A Compendium of Irish Biography. Charleston: BiblioLife. ISBN 978-1116472684. Allnatt, Charles F. B. (2007). Cathedra Petri. Whitefish, Montana: Kessinger Publishing. ISBN 978-0548785072. Blackburn, Bonnie; Holford-Strevens, Leofranc (1999). The Oxford Companion to the Year. Oxford University Press. ISBN 978-0192142313. Concannon, Thomas (2010). The Life of St. Columban. Wimpole Close: BCR. ISBN 978-1117876894. Cusack, Margaret Anne (2002). The Illustrated History of Ireland. New York: Gramercy. ISBN 978-0517629147. Edmonds, Columba (1908). "St. Columbanus". The Catholic Encyclopedia. 4. New York: Robert Appleton Company. ASIN B000R4GCD8. Gray, Patrick T. R., and Michael W. Herren (1994). "Columbanus and the Three Chapters Controversy" in Journal of Theological Studies, NS, 45, pp. 160–170. Healy, John (1892). "Saint Columbanus" . The ancient Irish church (1 ed.). London: Religious Tract Society. pp. 70–81. Jonas (2009). Life of St. Columban. Charleston: BiblioLife. ISBN 978-1113338648. Mc Sweeney, Richard (2015). Abiding in Bobbio. Raleigh, North Carolina: Lulu. ISBN 978-1329382237. Montalembert, Charles Forbes (1861). The Monks of the West. 2. London: William Blackwood. Moran, Patrick Francis (2010). Irish Saints in Great Britain. Charleston: Nabu Press. ISBN 978-1176742925. Ó Fiaich, Tomás (2012). Columbanus in His Own Words. Dublin: Veritas. ISBN 978-1847303578. O'Hara, Alexander (2015). Saint Columbanus: Selected Writings. Dublin: Veritas. ISBN 978-1847305879. Richter, Michael (2008). Bobbio in the Early Middle Ages: The Abiding Legacy of Columbanus. Dublin: Four Courts Press. ISBN 978-1846821035. Smith, Sir William; Wace, Henry (2012). A Dictionary of Christian Biography, Literature, Sects and Doctrines. Charleston: Nabu Press. ISBN 978-1286170847. Stokes, Margaret (2007). Six Months in the Apennines. Whitefish, Montana: Kessinger Publishing. ISBN 978-0548271971. Wallace, Martin (1995). A Little Book of Celtic Saints. Belfast: Appletree Press. ISBN 978-0862814564. Wilson, James (1954). Life of St. Columban. Dublin: Clonmore and Reynolds Ltd. ASIN B0007IWDF0. "St. Columbanus" . Catholic Encyclopedia. 1913. "Columban, Saint" . New International Encyclopedia. 1905.